Awnings provide ample shade during hot and sunny summer months— consider the range of options before choosing a new awning. 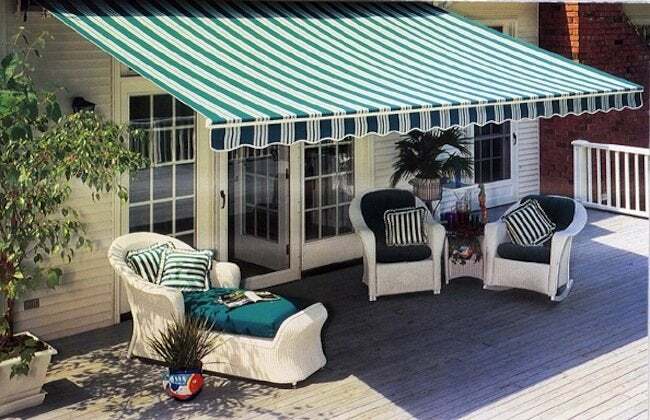 If you’re looking for a little more shade this summer, maybe an awning is the way to go. Let’s review the basics and consider your awning options. Awnings are overhangs, either fixed or retractable, mounted on a house’s exterior. They’re typically placed above a window, door, or patio to provide shade. In fact, the area under an awning can be as much as 20 degrees cooler than the surrounding temperature. But awnings have benefits beyond shade. Because they block sunlight, awnings cut down on heat gain indoors, which can translate to more comfortable room temperatures and lower energy bills in the summer months. They shield windows, doors, decks, and patios from dirt; prevent fading and cracking from too much sunlight; and protect against the damaging effects of weather. Plus, during rainstorms, they can help channel water away from the house, cutting down on basement seepage. If an awning sounds right for you, you’ll have some decisions to make, including materials and functionality. Awnings are usually made of aluminum or a sturdy fabric such as cotton canvas or one of today’s mildew-, water-, and UV ray-resistant synthetics. You’ll also need to decide whether you want fixed or retractable awnings, and if retractable, either manual or motorized operation.